This advanced bio-active serum contains a cocktail of anti-ageing, skin revitalising ingredients, to kick-start lacklustre complexions & restore a youthful radiance. With regular use, fine lines & wrinkles are reduced; skin becomes firmer & plumper with an even tone & refined texture. 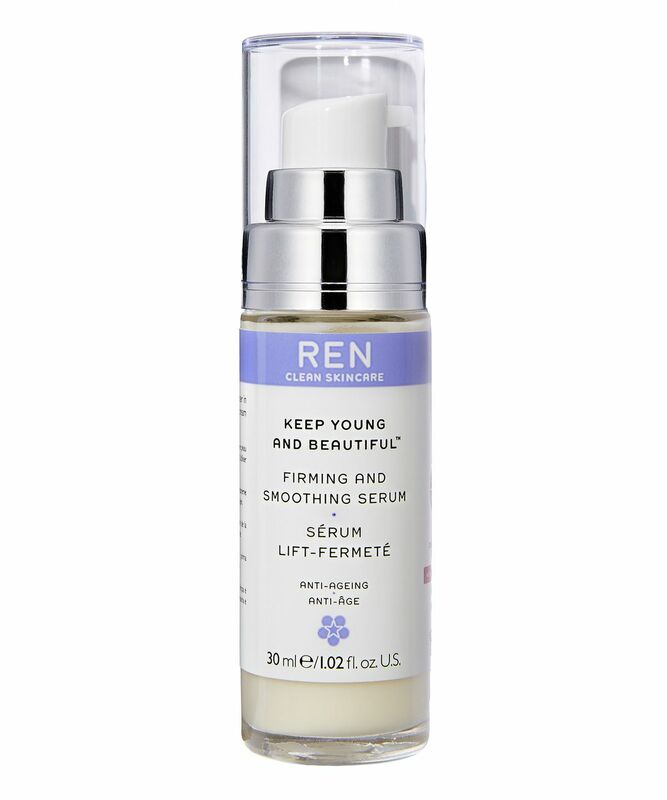 REN CLEAN SKINCARE is known for pioneering new ways of applying the latest discoveries in phyto-science & mineral technology to produce skincare formulations that boost skin's natural processes without any chemical nasties. 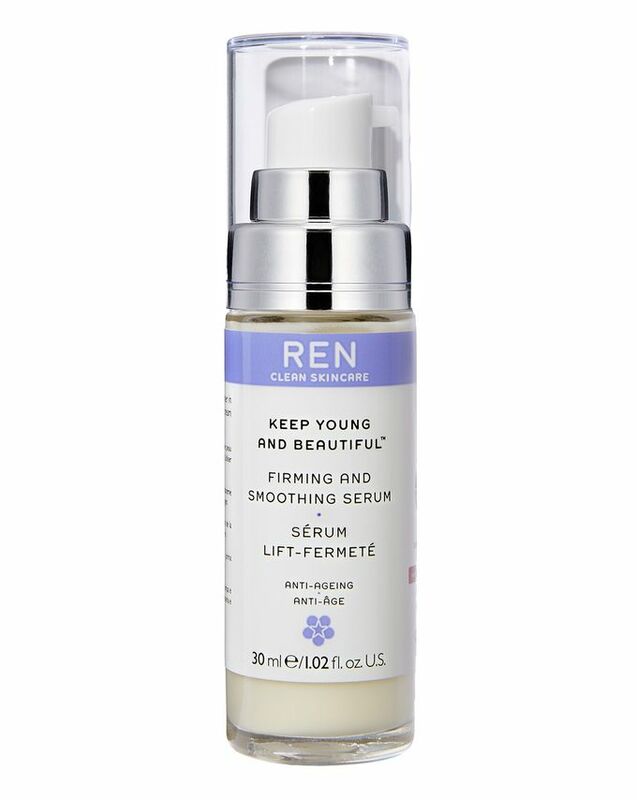 There's no excuse not to look your beautiful best with REN CLEAN SKINCARE's Keep Young and Beautiful Firming and Smoothing Serum! With Hexapeptides from yeast to stimulate skin cell renewal and the synthesis of firming proteins; Native Peptides act as muscle relaxants (like topical Botox) to iron out expression lines; Glycosaminoglycans and Hyaluronic Acid help attract and retain moisture to 'plump up' skin, while Sitruin increases the lifetime of cells to help them repair and un-do superficial damage. Apply to cleansed skin both morning and evening, before your usual moisturiser or night cream. Rosa Damascena Flower Water, Glycerin, Alcohol, Cetearyl Olivate, Ascorbyl Tetraisopalmitate, Rosa Canina Fruit Oil, Palmitoyl Hydrolyzed Wheat Protein, Phospholipids, Zostera Marina Pectin, Sorbitan Olivate, Hydrolyzed Glycosaminoglycans, Vaccinium Vitis-Idaea (Lingonberry) Seed Oil, Sodium Hyaluronate, Dipalmitoyl Hydroxyproline, Caprylic/Capric Triglyceride, Hexapeptide-11, Commiphora Mukul Resin Extract, Phenoxyethanol, Faex (Yeast) Extract, Panax Ginseng Root Extact, Gynostemma Pentaphyllum Leaf Extract, Magnesium Aspartate, Zinc Gluconate, Copper Gluconate, Parfum (Fragrance), Linalool, Limonene, Farnesol, Oryza Sativa (Rice) Extract, Sodium Hydroxymethylglycinate, Xanthan Gum, Tocopherol. I have a dry to normal skin, the most bothering thing to me is the fine lines on my face. I've been using this for like 2 weeks and it really do firm the lines around my nose, corner of my mouth and most amazingly it do refine the texture of my face. I will continue to use this product, and recommend it to friends! !